Ali A. Sirusi and Joseph H. Ross Jr. 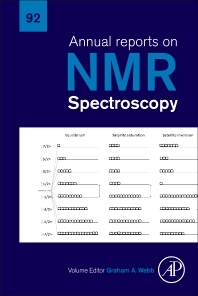 Annual Reports on NMR Spectroscopy, Volume 92 provides a thorough and in-depth accounting of progress in nuclear magnetic resonance (NMR) spectroscopy and its many applications. Topics presented include new chapters on The DEPT Experiment and Some of Its Useful Variants, NMR Studies of Organic Aerosols, Recent NMR Studies of Thermoelectric Materials, Nonlinear Effects in NMR, Applications of Solid-State 43 Ca Nuclear Magnetic Resonance: Superconductors, Glasses, Biomaterials, and NMR Crystallography, and Solid-State NMR Spectroscopy: The Magic Wand to View Bone at Nanoscopic Resolution.